The Marinater had just moved back to Las Vegas, and Happy Meal and I wanted to pay tribute. I had tried burgers at Caesars Palace before. Bradley Ogden (closed) and P.J. Clarke's both failed to deliver. The "third time's a charm" rule came into play, and we met up at Munchbar (near the poker room). Munchbar had a great vibe: bustling, enthusiastic, happy and knowledgeable staff, and great looking dishes coming out of the kitchen. It was a chef's menu, so it was all bold flavor combinations with no shortage of bacon. We ordered a couple of the Munch Burgers and a BBQ Bacon Burger. 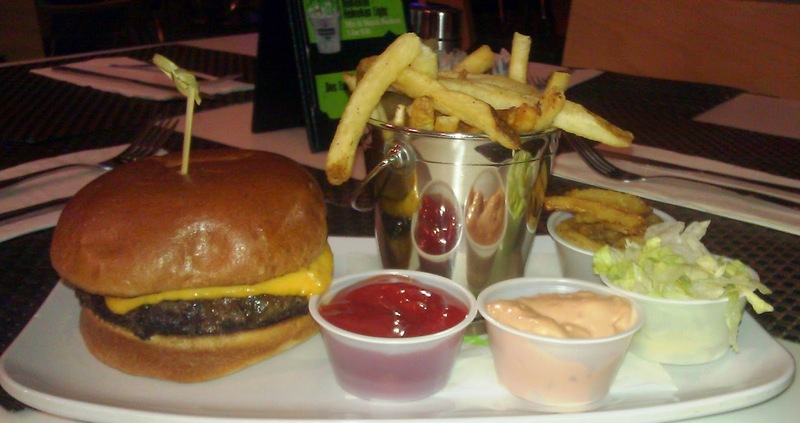 The 10 ounce burgers were $15.95, and each came with a bucket of fries. We only had to kill about 10 minutes until our burgers arrived. The Beef: The large patties were Certified Grass-Fed Angus Chuck. The fat content was 19% (very meticulous chef). The uniformly round and flat burger patties arrived pre-formed courtesy of Desert Meats. The flavor was strongly beefy. The mouth feel was firm and just chewy enough to create a strong sense of eating meat. The burger was juicy without being greasy. At 10 ounces, this was a lot of beef. The Sear: The griddle at Munchbar was properly hot, and this imparted a nice and flavorful sear to the burger patty. The sear created a crisp layer of beef, which provided a shift in texture that was interesting. A good sear always elevates a burger. The Preparation: The staff at Munchbar were on their game in terms of consistency, efficiency, quality, and presentation. The plates arrived swiftly and looking perfect--not a single thing out of place. The Cheese: Munchbar used a mild Cheddar on the Munch Burgers. Other burgers received slices of Bleu Cheese. The sliced product came into play after patrons complained that the crumbled Bleu was too strongly flavored. Points to Munchbar for making the adjustment. The cheese slice on the savory Munch Burgers was thick enough to provide some texture. I should have gone with the Bleu or an American to complement the big burger. The Bun: This was a standard, unseeded, burger bun. The bun was fresh, moist, sweet, and just substantial enough to stand up to the over-sized patty. The bun was lightly toasted, and it provided a nice crunch around the edges. The Toppings: The toppings (lettuce, onion, and tomato) were all fresh and ripe. I generally ignored these as I attempted to work through the large burger and bucket of fries. The Fries: The fries at Munchbar were the perfect version of Five Guys fries. The fries were peel-on, par-cooked, frozen, bagged, and delivered. They were perfectly crisped, browned, and seasoned. There was not hint of sogginess, even as the fries cooled. 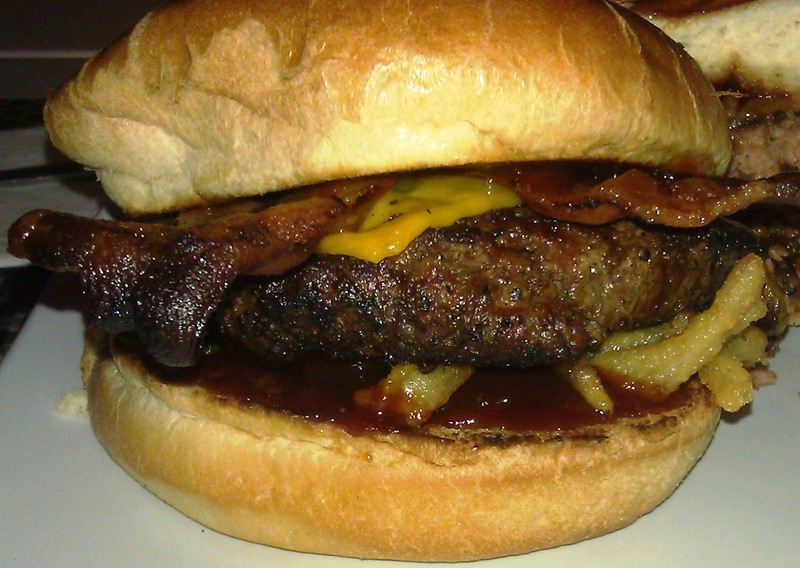 The BBQ Bacon Burger: Come on! Imagine a really good and really big burger patty but with BBQ sauce, bacon, and crispy onion strips. It was fantastic. The Value: The value at Munchbar was right down the middle considering the fact that the burgers were huge, made from high quality ingredients, and arrived with a bucket of fries. Munchbar did everything right. The staff, the menu, and the food were all on point. Burger Review : A massive burger/meal at a reasonable price. A great experience and high-quality food at Munchbar.